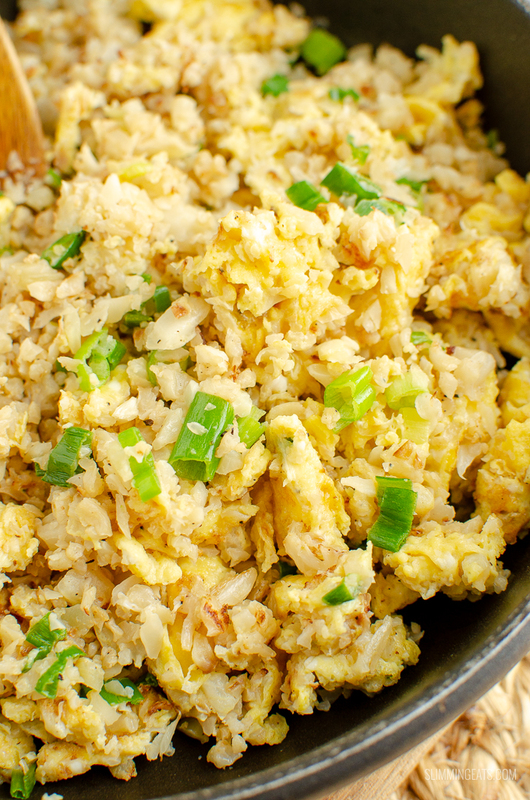 Cauliflower is the perfect ingredient for a healthier low carb option to regular rice. 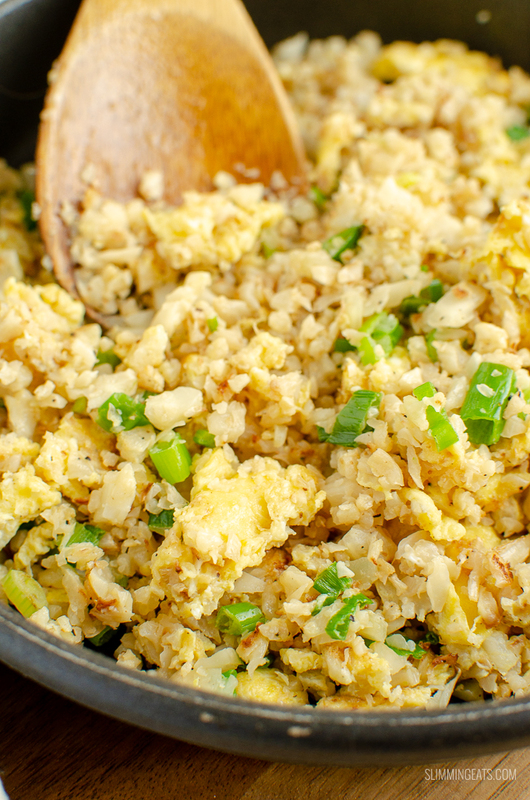 So if you need something that feels like rice to mop up the delicious sauces from your Chinese Fakeaway dishes, then this is the Egg Fried Cauliflower Rice perfect recipe for you. Many are put off using cauliflower as it can be rather pungent when raw or even with cooking. But me perfect method for cooking cauliflower rice will totally change your mind. There are many methods out there for making cauliflower rice from steaming to microwave. But the real game changer for me when it came to cauliflower rice, is to cook it by roasting. We’ve all had roasted cauliflower right? and you know how amazingly tasty that is, so why on earth would you not want to cook cauliflower rice the same way too. Most grocery stores will now even sell bags or ready grated cauliflower that you can grab and throw in your shopping cart. But sometimes they tend to be super expensive just for the convenience. I’ve also worked out a method for prepping the cauliflower into rice, that means minimal mess and we all like less mess to clean up afterwards. 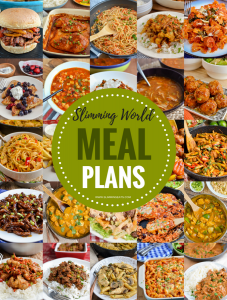 I will never forget the first time I attempted cauliflower rice, it was everywhere, the floor, the kitchen units, some stuck to my slippers – in fact, every surface that the cauliflower rice could fall to, it fell. and then I cooked it in the microwave which seems to be one of the popular choices for cauliflower rice. OMG, never again will I cook cauliflower rice in the microwave. As if the mess I had just created wasn’t enough, I now had the most awful sulfur stench throughout my kitchen. It put me off attempting cauliflower rice again for a while. Until I finally succumbed, but the next time made sure that cauliflower never went anywhere near a microwave. My failproof method for a limited mess is to make sure you prep the cauliflower on an extra large baking sheet lined with parchment. I place the baking sheet right next to my Ninja Food Processor and work in batches. You can break into florets on the tray first, add some to the food processor, pulse a few times till it resembles grains of rice and dump on a clear section of the tray, before adding some more and repeating. Then all you have to do is spread the cauliflower rice out on the tray in an even layer, season, spray over the top with cooking oil spray and roast in the oven – simple!! No mess all over the floor, or the kitchen units. 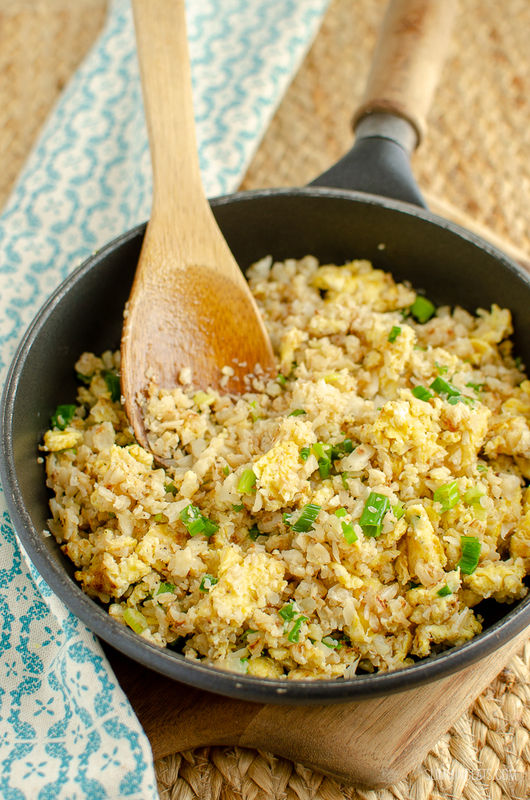 Once it’s all cooked it’s ready to be turned into this delicious Egg Fried Cauliflower Rice. 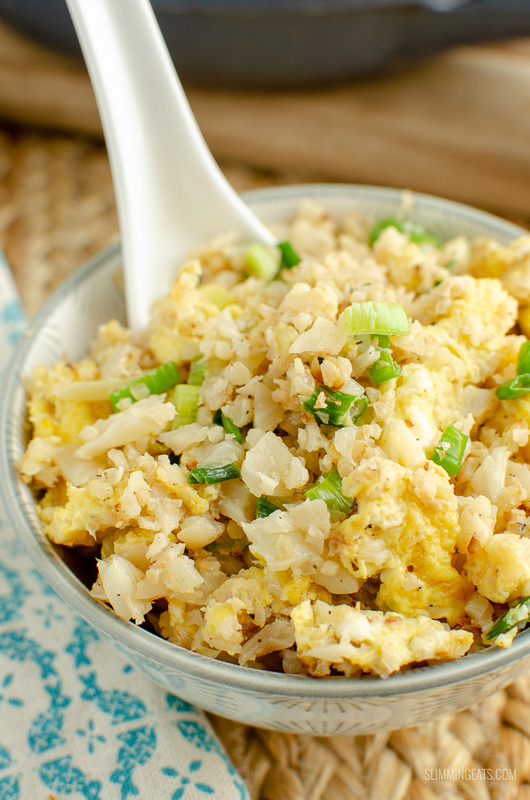 Wonder what yummy Chinese Fakeaway Dishes you could serve this Egg Fried Cauliflower Rice with? 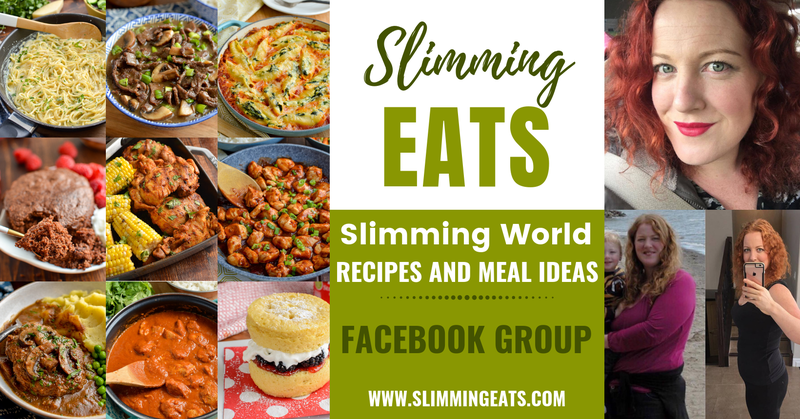 Check out some of these recipes. What Kitchen Items do I need to make this Egg Fried Cauliflower Rice? Line a large baking tray with some parchment paper. Place a few florets at a time, in a blender or food processor and pulse the blade a couple of times, until it resembles grains of rice, dump that onto the tray, before continuing with the next batch, until all cauliflower is riced. Spread out on the tray in a thin even layer and season well with salt and black pepper. Spray over the top with some cooking oil spray, place in the oven and bake for approx 30 mins, it will start to have browned on the edges. Remove from the oven and set aside. Just Like when making regular egg fried rice, I find it best if you let the cauliflower rice completely cool or even better cook it the day before, so it is chilled in the fridge before proceeding with the next steps. Spray a frying pan over a medium high heat with cooking oil spray. Add the cauliflower rice and stir fry for a minute or so, add in the soy sauce and toss to coat. Make a gap in the centre, spray with a little more cooking oil spray, and then pour in the whisked eggs, let it begin to set and then break up the egg into pieces with a wooden spoon and toss it through the cauliflower rice. Sprinkle in the chopped spring onions and season with black pepper. 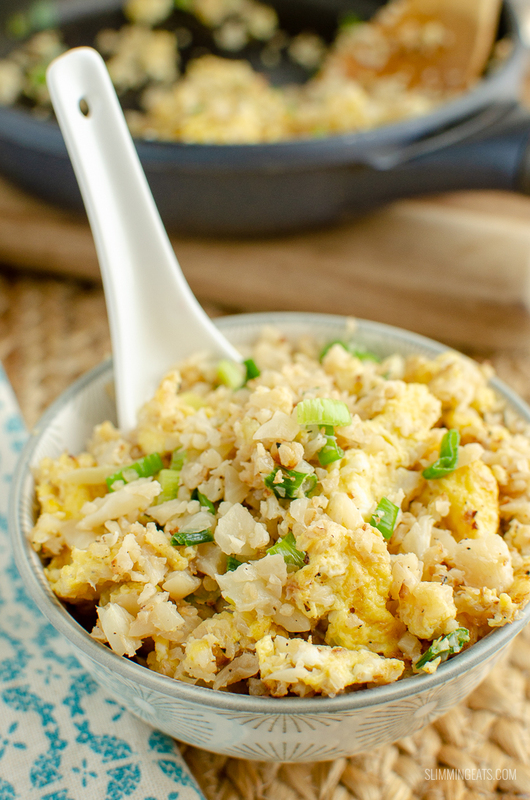 Serve and enjoy this healthy Egg Fried Cauliflower Rice. Probably a silly question, but when you freeze batches do you prep & roast it, cool it & then freeze, so you can just stir fry it & add egg on the day? Or do you blend it, bag it & freeze, then roast it etc on the day?